New York Magazine just ran a 6,000-word piece on Ohio Governor John Kasich (R), a guy whose opposition to the GOP’s various ACA repeal attempts and to Donald Trump have created what Kasich seems to believe is a legitimate political opening between the two ideological poles in 2020. That he’s able to market himself as a moderate signals just how immoderate the right has become. And that he’s able to market himself as a bomb-throwing outsider signals just how fully the party has thus far lined up behind its bomb-thrower-in-chief. He cut the budget deficit by $8 billion (a figure disputed by some) and raised the surplus to $2 billion. He says he’s created 400,000 jobs. Still, under Kasich, Ohioans — like so many in the industrial Midwest — are suffering. Ohio has one of the highest drug-related-death rates in the country; overdose deaths rose by a third to 4,000 last year. Job growth is lagging behind the national average, and wages are, too. College is costly, immigration and diversity are low, and infant mortality is 24 percent higher than the national rate. Certain of his innovations, taken from the conservative playbook, have had dubious effects. Kasich is a strong proponent of charter schools (and for-profit prisons), but he presides over a public-education system that dropped in Education Week’s national rankings from fifth place in 2010 to 22nd in 2016. 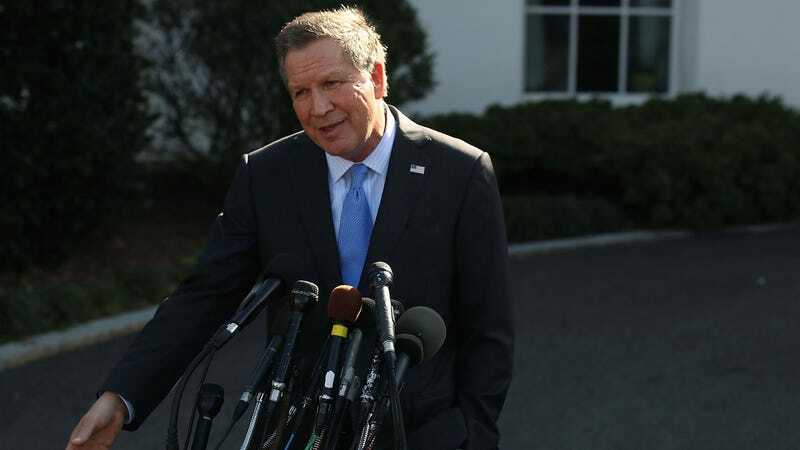 In 2011, Kasich endorsed the gutting of government unions (though it later failed a ballot referendum), and last year he signed a bill into law that bans all abortions after 20 weeks — and then boasted that he didn’t sign the law that banned abortion after an audible fetal heartbeat. How nice for John Kasich and his wife, that they don’t waste time arguing about whether or not women in Ohio should be subjected to forced birth. Not that Kasich doesn’t like to sit around and argue in general. He brow-beat a staffer on the record for not taking Miller to see a Holocaust memorial he’d installed, for example. He wanted to know why I hadn’t seen it. “We didn’t have any downtime,” said Lynch. Now that, certainly, is memorable. Read the full profile here.